As much as I enjoy the twinkly, magical atmosphere, Winter makes me feel lousy. Now I don’t know whether it’s the lack of sunlight or the fact that its cold all the time – but sometimes I would just like to tuck up in bed and hibernate until the world wakes up again in Spring! Winter is great however, for lots of things, like ice skating, hot chocolate, warm jumpers and those warm, comforting stews and meals you wouldn’t want to eat during the summer time. 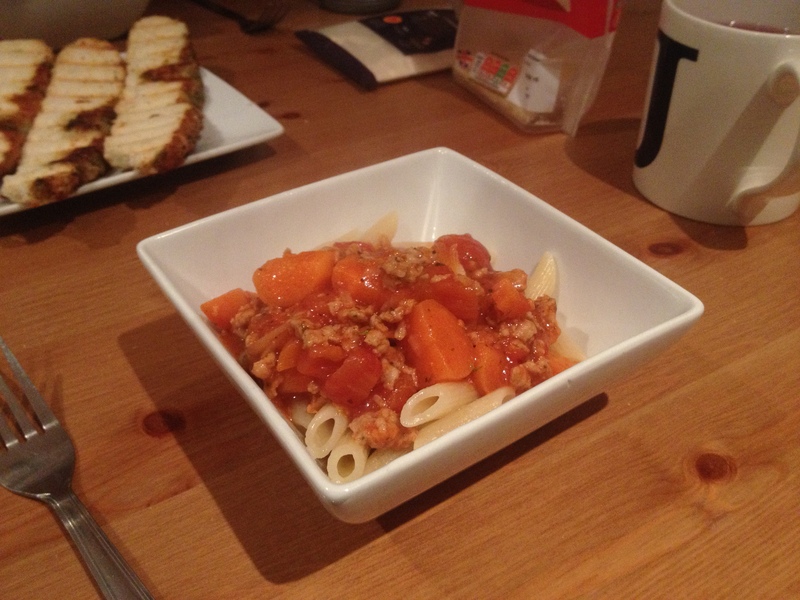 Tonight I came out of my hibernation to make Josh and I a nice big bowl of pasta was bolognaise – with a twist! At the Farmer’s Market this month we took the opportunity to stock up on meat from a local butcher’s stall. 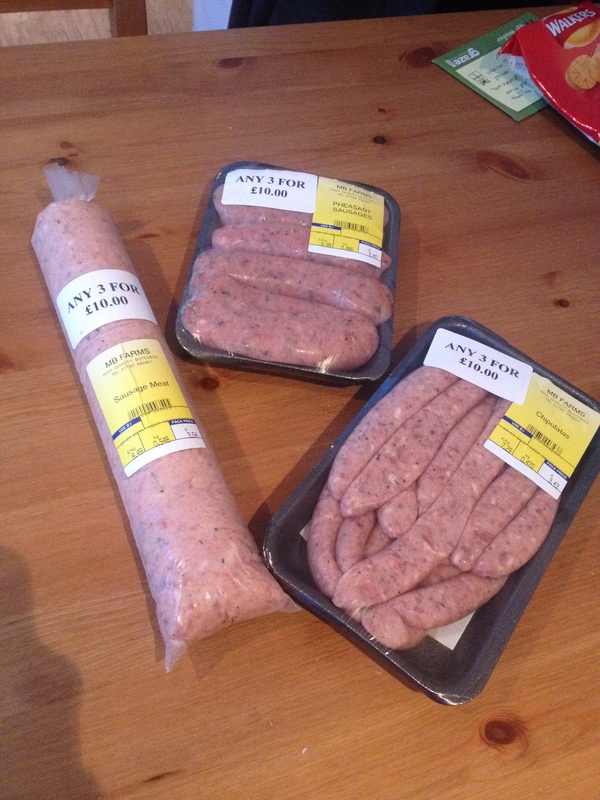 We got some beautiful chipolatas, some pheasant sausages to try and a nice big package of sausage meat. I didn’t want to just make sausage rolls with it (although there’s quite a lot of it so it may still happen yet!) so I decided to look on the internet for ideas. It turns out that people don’t get that adventurous with sausage meat – its sausage rolls or meatballs most of the time! But I did find a forum where people were discussing using sausage meat in a lasagna – and this gave me an idea – what about Sausage Meat Bolognaise! It worked really well but there are several steps that I think were pretty crucial in making this one. For example, I think it’s pretty important to brown the sausage meat first in a frying pan and keep squashing it with the back of a fork to break it up. This made it into a nice mince texture and probably stopped it all clumping together or all falling apart when I cooked it all down at the end. I think it worked really well and the dish turned out really thick and comforting. The sausage meat was so good and gave the bolognaise a really meaty, sausage flavor. It turns out that you can spell bolognaise two ways – it’s bolognaise if you are from Italy and bolognese if your from France. Since I served it with pasta I went for the first option! Heat the oil in a frying pan. Add the sausage meat and mash it with the back of a fork until it separates into small pieces and resembles a mince texture. Cook for 10 minutes on a fairly high heat or until the meat looks cooked but is not brown. 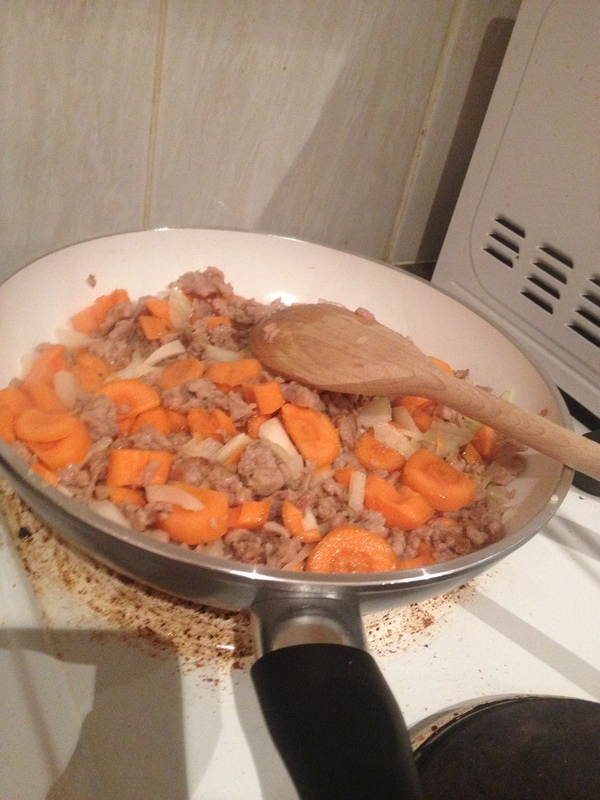 Add in the onion and carrots, continue to cook until the meat has gone brown and the onions are translucent. 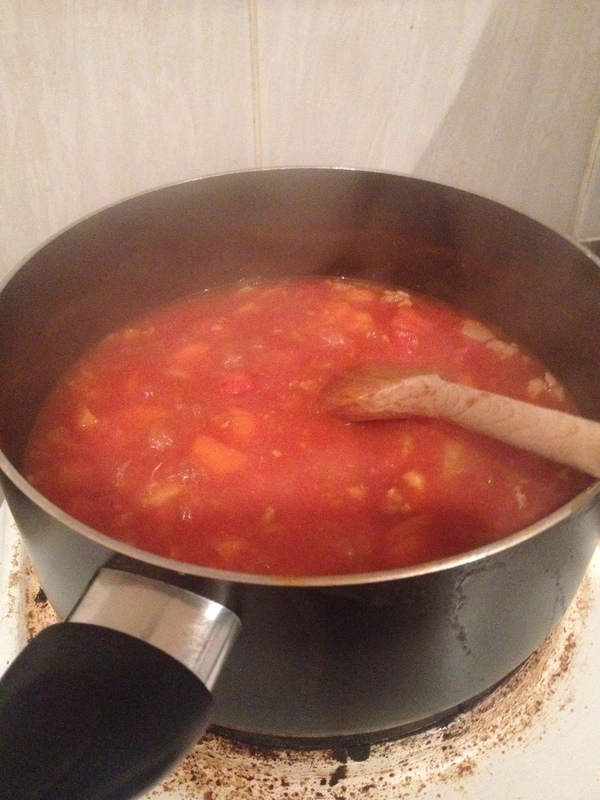 Add in the tin of chopped tomatoes and the tomato puree. Stir until all the ingredients are combined and bring to the boil. Reduce the heat so the mixture is on a simmer and leave to cook for 30 minutes stirring occasionally. The bolognaise is ready when the mixture has thickened and piping hot. In the last five minutes add your chosen sweetener and the teaspoon of mixed herbs. It can be served with pasta or even on a jacket potato! ← Exploring Edinburgh – The last *Honeymoon* post!